Captain Harry Warner took early retirement from the Royal Artillery in 1925 and began a successful involvement in a seaside restaurant business which later led to the opening of his first holiday camp in 1931 on Hayling Island. Other sites were soon acquired and by the outbreak of war his empire had grown to four camps. He was also one of the founder members of the National Federation of Permanent Holiday Camps. One of the his early camps was at Dovercourt in Essex and there is evidence to suggest that Billy Butlin was also considering this site before deciding on Clacton. In fact Butlin and Warner became good friends and Warner helped with the design of the new Filey camp whilst Butlin served on the Warners board during its early years. The Dovercourt camp (since demolished) was later used for the exterior scenes in the hit BBC comedy 'Hi-de-Hi'. After the war Warner set about expanding his empire and his three sons, Bill, John and Alen, joined the company. By 1960 they had eight camps and within five years the number had risen to 11. Warner reportedly had a "gentleman's agreement" with Butlin whereby he could take the south of England whilst Butlin had the north. If true, Butlin obviously broke this agreement when he opened the Bognor camp in 1960! (and again at Minehead in 1962). Harry Warner died in 1964 at the age of 75. The company continued to florish under the control of his sons and by the 1970s the empire had grown to 14 camps. They were all fairly small when compared to Butlins or indeed Pontins (the average size was around 500 to 600 holidaymakers) but all boasted the usual holiday camp facilities such as swimming pools, bars, clubs and sporting activities. One of the camps on the Isle of Wight (Puckpool) was used extensively during the filming of the cult 1973 movie "That'll Be The Day" staring David Essex, Ringo Starr and Keith Moon. 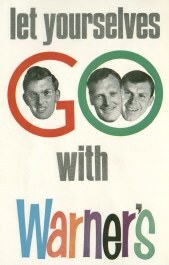 Warners was eventually sold to Grand Metropolitain in 1983 and then to Rank in 1987. In 1994 a major revamp of the business was announced and several camps were sold with the remainder undergoing a major overhaul. Warners also announced the decision to turn themselves into an adults-only holiday company and entered the hotel market by acquiring a number of historic mansion houses and transforming them into some wonderfully unique vacation centres. The company is still very successful and is still part of the same organisation which now owns Butlins (Bourne Leisure Ltd). Any additional Warners info and photos most welcome!